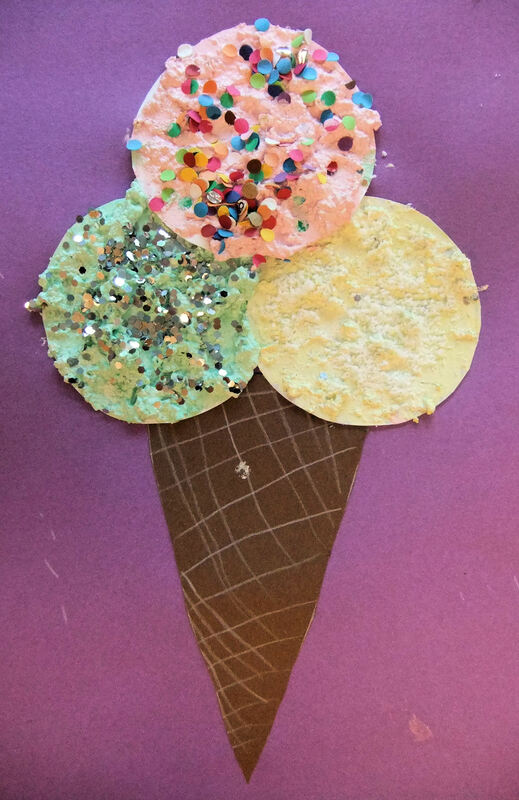 A project with my 3 and 4 year olds, to celebrate the start of the ice cream season! The first task was to cut out three circles from white card and a triangle from brown paper, adding a wafer texture by drawing criss-cross white pencil lines on the brown cone shape. The kids couldn’t wait to get their fingers into the gloopy, lumpy paint, which we made by mixing white paint with lots of baby oatmeal. Flour would also work well to thicken up the paint – I just happened to have a lot of baby cereal left over so I thought this would be a great way to use it up! To the thickened white paint we added a little red, yellow and green paint to create three ice cream flavours: strawberry, vanilla and pistachio/mint. 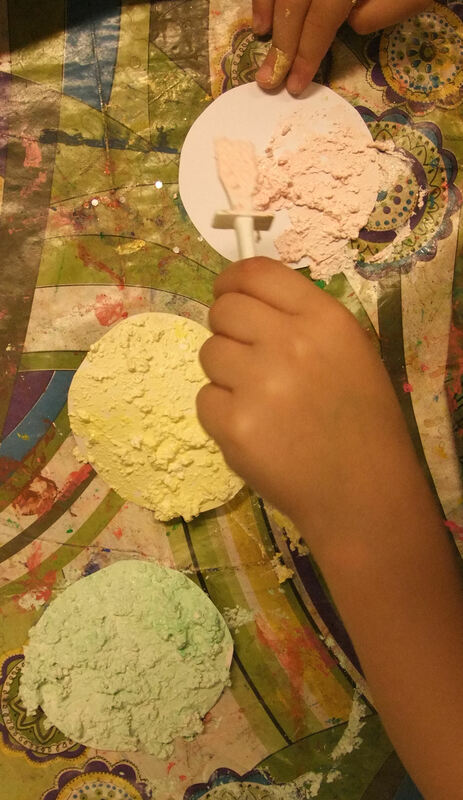 The paint was too viscous to apply with paintbrushes, so the kids scooped it up and patted it down onto their cardboard circles using plastic glue spreaders. It was great fun splodging the paint around! Then the finishing touches – no ice cream is complete without sprinkles! Three to choose from: glitter, dessicated coconut and multi-coloured paper confetti (which I made beforehand using a hole punch and scrap paper). With these toppings scattered all over the lumpy, bumpy paint, the finished ice cream pictures really did look good enough to eat! Based on an idea from Paper Crafts. This is great! I’m going to share your blog with the other teachers – I think our kids would love this.